Happy Monday, everyone! This week will be a short one since I'm taking my first official day off in five months. We'll be leaving Thursday night for the beach and I'm counting down the days until we're there. In the meantime, I want to introduce you to my favorite pants. Everyone, meet my new Vince silk pants. Silk pants are just like pj pants - so ridiculously comfortable! I scored these Vince ones for an incredible sale price so go ahead and buy yourself a pair! I'll be wearing mine a lot so be prepared to see them a few more times around these parts. p.s. I didn't want to forget to tell you about LiketoKnow:It - the most brilliant concept ever. If you follow me on Instagram and want to receive links to shop what I'm wearing right to your inbox then LiketoKnow:It is here for you. Sign up (you only need to enter your email to sign up!) by clicking here and double tap my Instagram pictures so you receive shoppable links right to your inbox. Enjoy! Love how easy and breezy these pants are, perfect for summer da ys! such easy pants...love the look..perfect for summer travel too! i love your necklace layers! xo jillian - stop by cornflake dreams, I'm hosting a giveaway! Those track pants are beyond ideal!! Effortlessly chic!!! Love this look! LOVE those pants! You look fab! 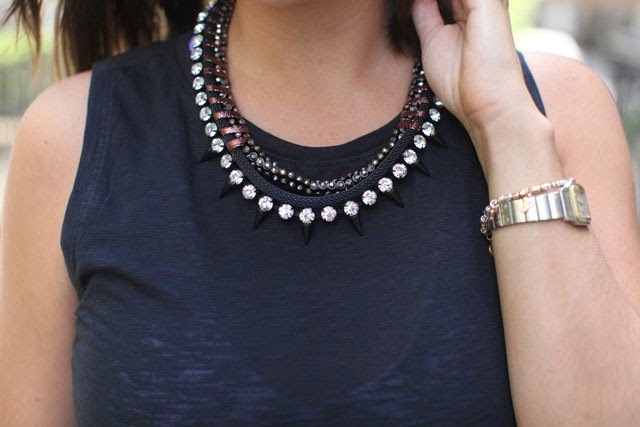 From the spiky necklace to the silky pants, this look is just cool. Love it, Viv! Super cute! Love this casual summer look. Well hello there hottie! Love this look on you! You look amazing! I hope you had a wonderful day off! loving the shades, they look great for the summer! This entire outfit is perfection, especially those trousers! I love how chic this outfit is! Those pants look great on you. I hope you enjoyed your day off! Love these pants! I have the shorts version....pants are perfect for transition to fall!